These photos are of the author’s father Manley H. Mitton on a visit to Great Mitton in 1937. Manley was born Aug.11,1908, Detroit, Mich., died June 30, 2005. He is speaking with the vicar of All Hallows church at Mitton, the Rev. Frederick George Ackerley. The building behind is the church and the one in the foreground is the then Mitton post office with a telephone booth. Another item below is a postcard of the church addressed to his father Urville M. Mitton whose grandfather was John Mitton aka.”Grover John” of Kent County, Ontario Canada. John had emigrated as an infant from Horton-in-Ribblesdale in 1819. Horton is about 22 miles northeast from this Great Mitton location along the Ribble river. 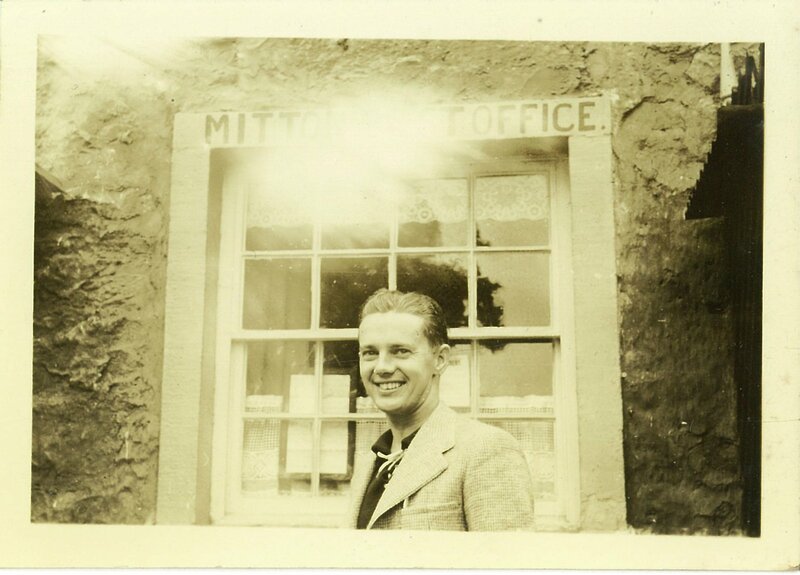 Manley Mitton, the author’s father in front of the Mitton Post Office in 1937 on a visit to England and France and did research on the Mitton family. 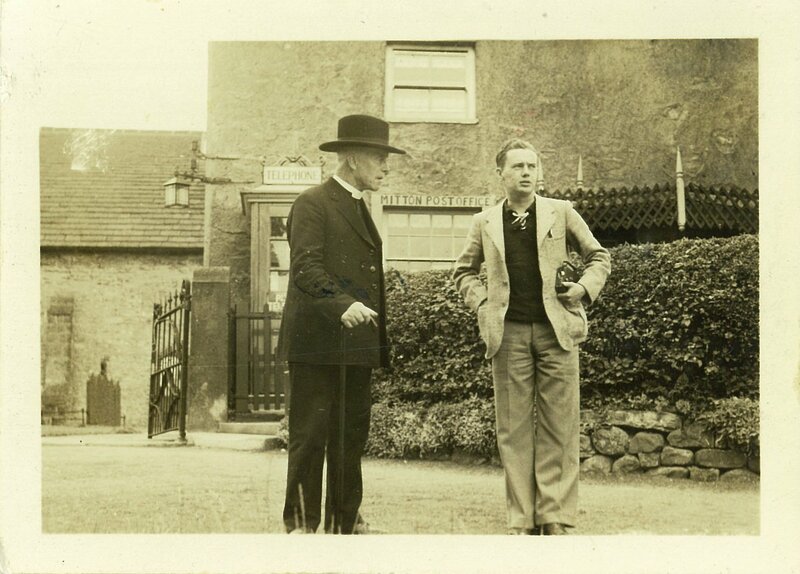 Manley H. Mitton above speaking to the “Vicar” of “ Mytton” Church and author Fredrick George Ackerley in 1937 (post card below confirms date). The Rev. Ackerley later published “A History of the Parish of Mitton” (1947) that included the early de Mitton genealogy from the 12th to 14th century. This photo was taken in front of the Mitton Post office which is now a house for the Mytton church curator. The church is right behind and little changed from 1937. 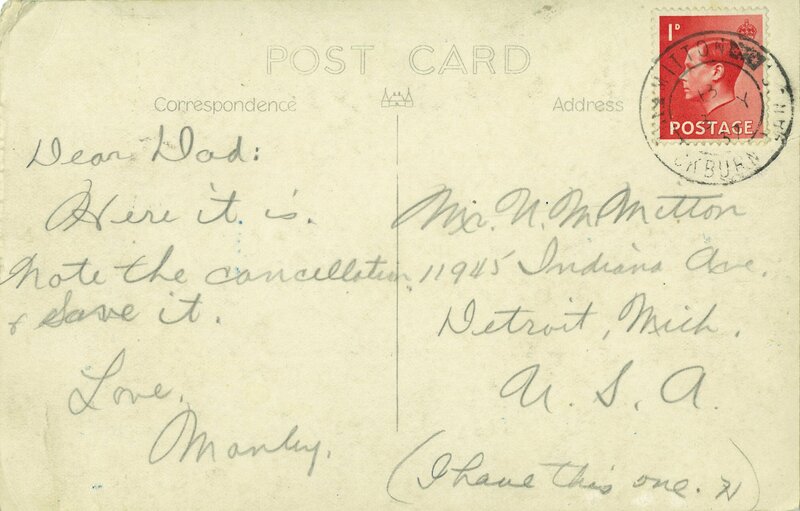 Below is post card sent to Manley’s father Urville Mitton, grandson of John Mitton known as “Grover John” of Kent County, Ontario. Urville was born in Ridgetown, Ontario in Kent county. “Grover John, was born in “Horton in Ribblesdale” Yorkshire England approx. 30 or less miles from where these pictures were taken in Great Mitton. John Mitton immigrated to Canada in 1818. It was his son Edmund that wrote down the family genealogy in 1906 that documented the family lines back to Horton and “Squire” Joesph Mitton 1723-92. The author of this paper is Manley’s only son, Bruce Floyd Mitton aka. “Bruce the Great” and from whom some of the original family history was passed down from his father Manley, from his father Urville and his father Edmund who wrote it down in 1906 and documented by subsequent genealogists. Note: the stamp has the profile of King Edward Vlll that confirms that unique date. Edward had abdicated in 1936. The author believes Manley’s visit was in 1937 as he also had a homemade movie of the young princesses, Elizabeth and Margarete arriving by car at a castle. Bruce Floyd Mitton standing in about the same location as his father in 1937. The above was July 2014 with the Rev. 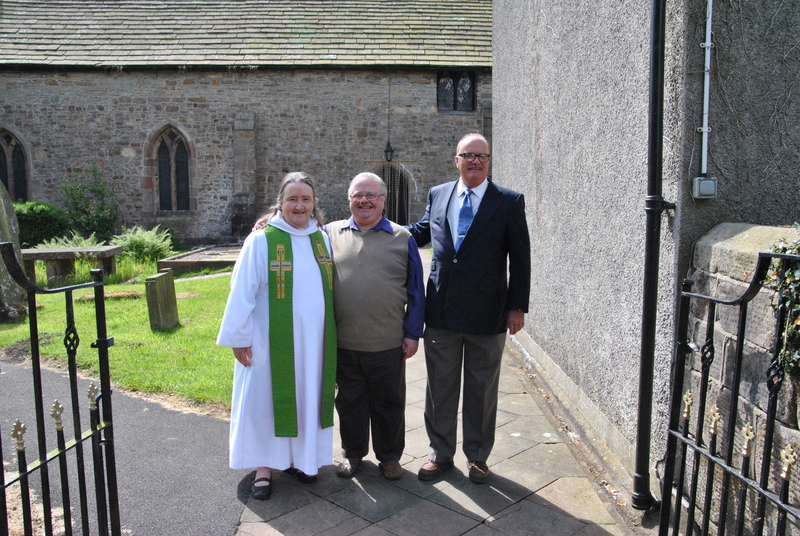 Gill Mack and husband and reader Gerald Mack of Mytton Church.